As option traders, we must choose between competing opportunities for employing our finite trading funds. Part of the selection process has to involve calculating the likely return on investment. This is a little more challenging for option trades than it would be for single-dimensional instruments like stocks or futures, because option prices do not follow stock prices in a linear way. Still, with the right tools we can zero in on the metrics we need. 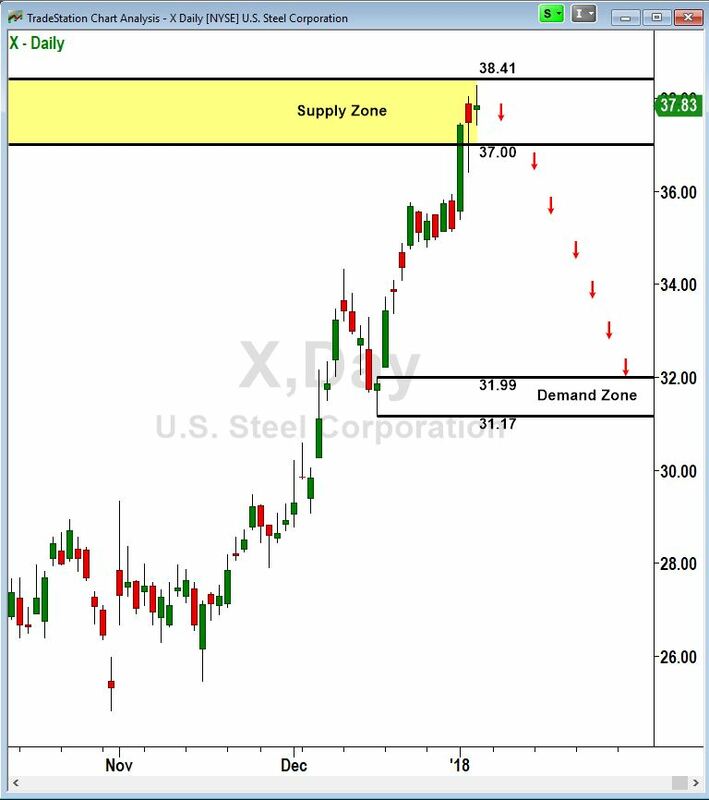 We believe (let’s say) that the most likely path for the price of the stock US Steel (X) is to reverse out of the supply zone it is currently in at around $38.00, and head down to the last major demand zone around $32.00. This trip took about six trading days last time it occurred in March 2017 (not shown on the chart), but we’ll allow a month to be safe. The time period is important because the prices of options slowly go down over time through the process called time decay. That is a headwind that we have to take into account. what our return on investment (ROI) will be if we do succeed on the trade. Sell short 100 shares of the stock when/if it drops down through the proximal (lower) line of our demand zone at 37.00. This movement would be the confirmation that the expected reversal has begun. OR cancel the trade without entering it if X rises above the distal (upper) line of the demand zone at 38.41 before dropping below 37.00. In that case, our supply zone would have been proven not strong enough to reverse the direction and we would look for another opportunity. No harm, no foul. Once in the trade, take profit by buying to cover the short position if/when the price of X drops to our target at 31.99. On the other hand, if after we enter the trade and the price of X rises above our upper boundary at 38.41, we will exit the trade for a small loss. We’ll allow a bit of a buffer in case of a small excursion above the line, let’s say $.10. So, we’ll buy to cover the position if the price of X rises above 38.51. So, the proposed trade offers a reward to risk ratio of over 3 to 1, and a return on investment of 13.54% if successful. Now let’s consider this trade if using options instead of shares. First, let’s assume that instead of selling short 100 shares of stock, we bought one Put option at the next strike price just above our supply zone, which is the $39.00 strike. Each put option represents 100 shares of stock. We’ll use a put that expires several months out, say in April 2018. The April $39.00 Put could be bought for $403 at this time. This put option technically gives us the right to sell 100 shares of X stock at $39.00 per share, any time between now and the close of business on April 18, 2018. We actually have no intention of exercising this option (after all, we have no shares of X to sell). Knowing that the value of put options goes up when the price of the stock goes down, our intention is to sell the put itself at a higher price than the $400 we paid for it. It is not necessary to own any shares of the stock on which you buy options. If the price of X dropped to our $31.99 target, for example, the put would be worth at least the difference between $3199 (the cost at which one could buy 100 shares on the open market at that time), and $3900 (the price at which the $39 put gives us the guaranteed right to sell the shares at that time). This difference would be $3900 – $3199, or $701 minimum value of the put with the stock at our target. In fact, the put would be worth more than that $701 minimum (which is called its intrinsic value), depending on how much time was left in the put’s life when we wished to sell it. The longer it had to go, the more so-called time value it would have in addition to the $701 of intrinsic value. But for starters, let’s say it was the very day of expiration by the time the price of X reached our $31.99 target. In that case, there would be no time value (no time left) and the put would be worth $701. Given that we paid $403 for the put originally, we would have a profit of $701 – $403 = $302. On a $403 investment, this is a rate of return of $302 / $403 or 75%. If our target was hit earlier than the expiration day, then the put would retain more time value and we could sell it for a higher price and profit. For example, if the target was hit in a month, the value of the put is projected to be $755. This projection is done using an option P/L graph, which is a standard feature of most option trading platforms. I will describe the use of that tool in future articles. Using that same P/L graph tool, we can project that if instead of dropping to our target, X hits our stop-loss price of $38.51 a month from now, the value of the put at that time would be $337. If that occurred, we would sell the put at that $337 price and take our relatively small loss. On this trade, it is clear how the leverage inherent in options can increase our return on investment when we are right about the stock’s movement. This example was simplified somewhat, ignoring bid-ask spreads, commissions and a couple of other factors for the sake of clarity. Our intention was to demonstrate the process of analyzing an option trade and how that compares to analyzing a stock trade. I hope you found it useful.